Artist's concept of Japan's Akatsuki spacecraft at Venus. A Japanese spacecraft will get a second chance to orbit Venus this December, five years after zooming past the planet on its first try. The Akatsuki Venus probe was supposed to begin circling Earth's hellishly hot sister planet in December 2010, but the craft's main engine failed during the crucial orbital-insertion burn. 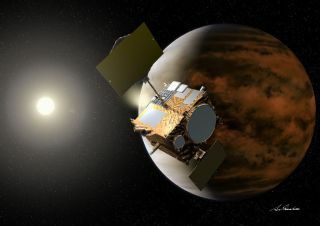 Akatsuki, whose name means "dawn" in Japanese, will then study Venus' atmosphere with a variety of instruments, gathering data about the planet's clouds, air circulation patterns and other characteristics. "When flying further away from Venus, or about 10 times the radius of Venus from the planet, the Akatsuki will continuously observe Venus as a whole to understand its clouds, deep atmosphere and surface conditions," JAXA officials wrote in a mission update in February. "When flying closer to Venus, or less than 10 times the radius of Venus, the orbiter will conduct close-up observations to clarify cloud convection, the distribution of minute undulatory motions and their changes." The $300 million Akatsuki probe launched in May 2010 on a mission to help researchers better understand how Venus, which was similar to Earth in the solar system's early days, ended up so hot and seemingly inhospitable to life. Akatsuki blasted off on the same rocket as JAXA's IKAROS (Interplanetary Kite-craft Accelerated by Radiation Of the Sun) spacecraft, which became the first probe ever to travel through deep space using a solar sail. The Akatsuki mission marks Japan's second attempt to explore another planet with a robotic space probe. The nation's first interplanetary spacecraft, the Nozomi Mars orbiter, also experienced problems after its launch, which occurred in 1998. A valve malfunction caused a significant amount of Nozomi's fuel to be lost, scuttling a planned 1999 Mars arrival. JAXA then worked to get Nozomi into orbit around the Red Planet in December 2003 but was unable to pull it off.